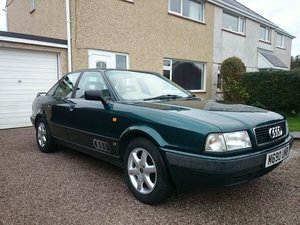 We have decided to offer this nice 2 litre 5 speed manual 1994 Audi 80 on an “As is” basis until such time things go a bit quieter and we do it ourselves, then charge full price. Coming in a package with others and had been standing, having last been mot’d in 2012 with 121685 on the clock ( now 121738). The engine sounds very good with good oil pressure and no signs of getting hot the heater and fan work. Everything works electrically . Its a manual roof but when you press the button to release the rear toneau cover it clicks but stays put, a common problem aparently but it can be released manually. Body work is good but there is a rub mark on the boot lid from the cover it was stored under and then a couple of scuffs etc elsewhere. Interior is very good no more than a good clean past the worn gear lever gaitor and the original over mat on the drivers side. Roof is good and the rear window has obviously been replaced. Wheels are all very nice with excellent tyres all round. We have driven it on a private road so can confirm breaks, clutch etc all work fine, even the hand break works. 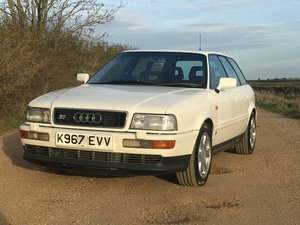 So on the face of it not far from seeing an mot ( oops forgot wipers and washers work,but needs new blades). A V5 will need to be applied for, this is something we can do for you at cost. So there you have it. 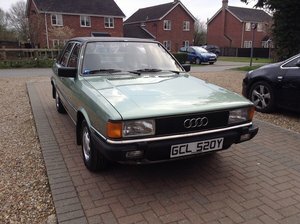 A very solid good looking classic Audi Cabriolet that with a little effort could soon be back on the road.